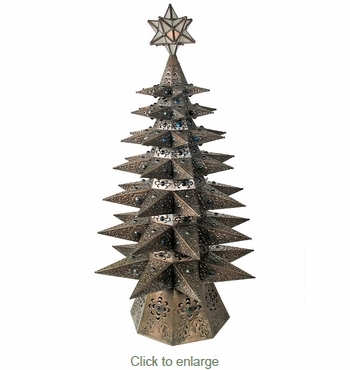 This lighted aged tin star Christmas tree will make your holiday display sparkle. Each star branch, with its hand punched designs and colored marbles, creates a dazzling effect for any Christmas decor. These unique Mexican Christmas trees are hand made from aged tin and wired with two light sockets. The handcrafted glass star on top includes a hinged access door to so you can illuminate it with tea light candle. These tin star Christmas trees will create a beautiful ambiance in any southwest, traditional Mexican or rustic Christmas decor.